Birth of new machine for loin ham and boneless ham manufacturing line! "HAMLER 720" thoroughly sought laborsaving and safety. 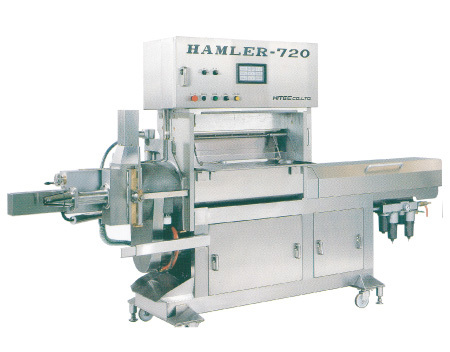 HAMLER 720 is the best suitable machine without parallel in the world to stuff fibrous casings or stuff nets in order to produce loin ham or boneless ham. Charge the material meat into the opening in the picture above. The maximum length of material ham to be charged is 720 mm. Unless the safety cover is closed after material meat is charged, the upper mould press cylinder does not operate so that it is quite safe. Material meat held between the upper and lower moulds will be strongly pressed with the cylinder from above. So the material meat shall be shaped as per moulds and the well-shaped products will be manufactured. 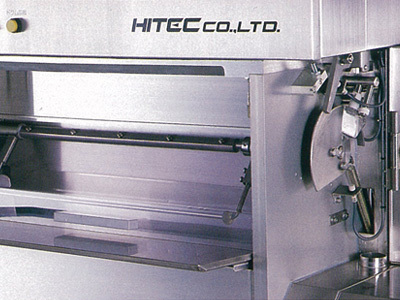 The adjustment of material meat length can be done simply with the dial shown in the picture. Also, by attaching the function of bringing out of end meats appeared at the back part of the picture, you can bring out the end meats remaining at the last separately and improve workability. 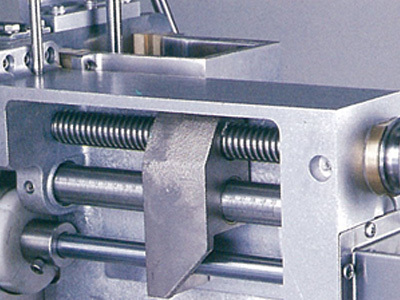 After the material meat formed with the moulds is measured with the supply pusher and equal weight pusher in a certain length, it is cut with a knife placed before the drum in the certain length (weight). 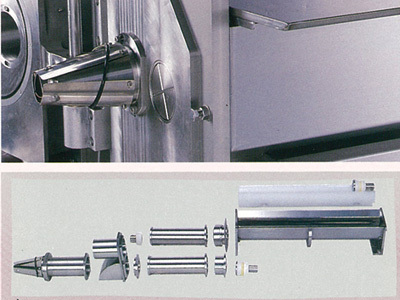 Further, as shown in the above picture, by opening the drum, attaching a tube and so without cutting the material meat at a certain length, you can stuff the material meat into such as long fibrous casings as it is, which can be used for sliced ham. 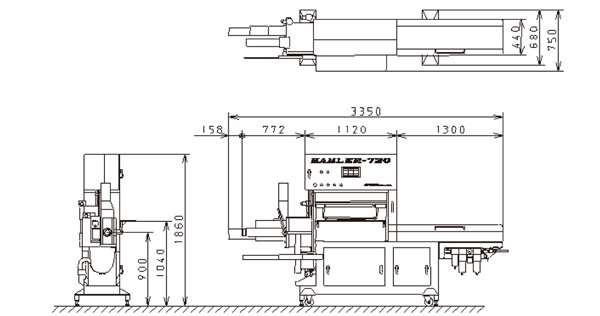 You can select a mould and a tube in size by 10mm from„φ55 to„φ95. So you can produce a ham which you like in size. Also, you can exchange the parts (as shown in the deal drawing) easily within a short time. Supply side In drum (right in the picture) Material meat cut in a certain length come to the drum at the discharge side (at the left side in the picture) by rotation of drum. 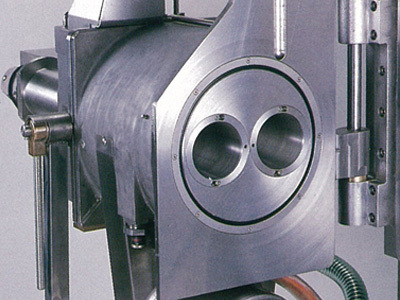 Meat material at discharge side of the drum shall be pushed out to the end of the tube with discharge pusher. The structure has excellent durability and maintainability. With function of removing of end meat, 16 pieces / min.